MicroStrategy Embeds Analytics Into Any Web Interface | Constellation Research Inc.
MicroStrategy HyperIntelligence surfaces customizable analytics from any browser-based application. CRM and ERP systems and custom apps and portals are just the beginning. No matter how “easy” or “intuitive” self-service analytics might be, the route to consumption typically sends users off to a separate, analytic interface, be it a report or a dashboard with lots of options for exploration and deeper analysis. But when users have only seconds to make decisions, they don’t have time (and won’t bother) to leave their business application to consult available analytics. Delivering insights quickly and within everyday applications is the idea behind HyperIntelligence, a new capability of MicroStrategy 2019, that latest release of that vendor’s venerable analytics platform. Available since December, HyperIntelligence got its splashy unveiling at MicroStrategy World 2019 (#Analytics19), held Feb. 4-6 in Phoenix, AZ, where it was one of three highlighted themes, along with Federated Analytics and Transformational Mobility. 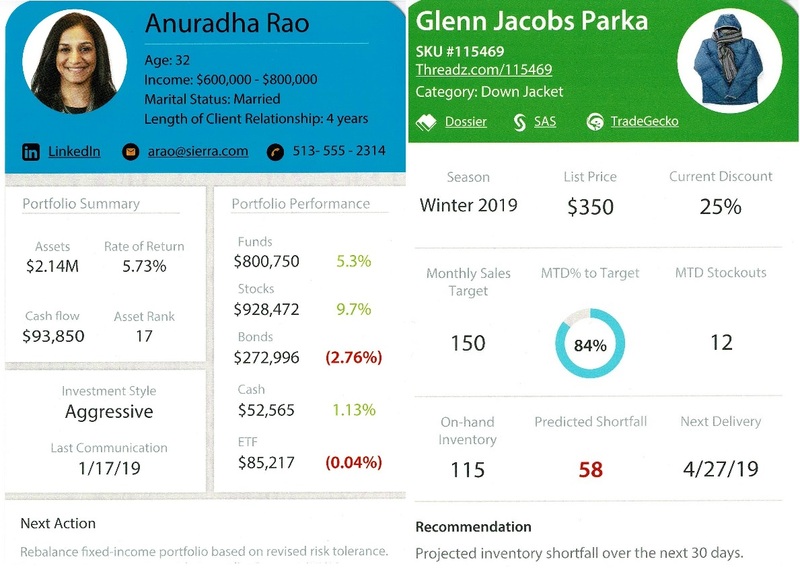 Here’s a closer look at all three, along with my take on MicroStrategy 2019. MicroStrategy’s HyperIntelligence technology surfaces and lets you drill down on customizable, analytic “HyperCards” whenever you hover a selected hyperlink. HyperIntelligence is a new embedded analytics approach that automatically hyperlinks customer names, product names, employee names or any other selected word type (think analytical dimension), that shows up on any web-based interface. When a user hovers over a link using their cursor, a customizable “HyperCard” appears. Cards can deliver enough insight to drive decisions on their own, but users can also click and drill down on the data to explore and analyze. 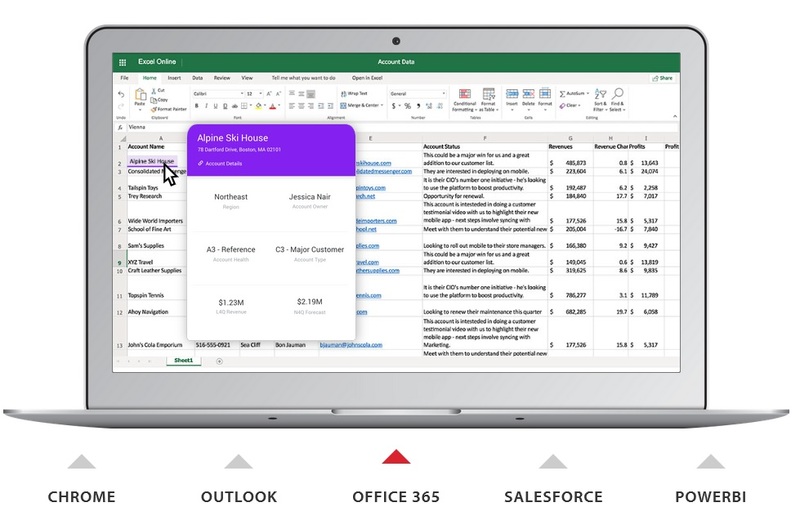 Hyperlinks and cards can be color-coded by type, so employees and related cards might show up in red while customer names and related cards could show up in blue and products in green. Each user has control over which cards they use and when they use them, so their interfaces won’t light up like Christmas trees as HyperCards and linking options proliferate across an organization. The possibilities for embedding analytics – whether descriptive, diagnostic or predictive -- are limitless, ranging from Salesforce, SAP, Workday, Office 365 or any other web-based interface to home-grown portals and applications. MicroStrategy CEO Michael Saylor even made a Microsoft Power BI dashboard “smarter” during a keynote demo, adding a link and surfacing a card with data from MicroStrategy that wasn’t available on the dashboard. Cutting-edge flourishes include “HyperVision” augmented-reality overlays that let you surface cards within live images. When a mobile device camera is trained on, for example, a retail shelf, HyperCards can be superimposed with insights on product inventory levels, expected shipments or profitability by product. HyperVoice adds an audible card option that can be personalized and triggered based on user identity, proximity and location. Federation is MicroStrategy’s platform-powered approach to feeding authoritative, well-governed data to an open ecosystem of analytical tools. The list includes not just the vendor’s own Dossiers and MicroStrategy Desktop, but also Microsoft Power BI, Tableau and Qlik. The platform can also deliver analytics embedded into third-party apps through new REST APIs added in MicroStrategy 2019. The latest release also beefs up R- and Python-based data science work through integration of the open source CRAN and PyPI packages. The resulting predictions can be fed back into HyperCards, Dossiers, reports, custom applications and third-party systems. MicroStrategy makes data accessible through its semantic modeling layer, which has been rechristened as the Enterprise Semantic Graph in MicroStrategy 2019. The Enterprise Semantic Graph is at the heart of new natural language query capabilities and emerging machine-learning and pattern-recognition-based recommendations. For now these smart/augmented analytic capabilities include recommending visualization approaches, data sets, or existing assets based on data selections and user- and role-based behavior patterns. MicroStrategy is also working on spotting correlations, patterns, exceptions and influencers within data sets, and it expects to deliver this functionality by year-end 2019. MicroStrategy helped pioneer mobile business intelligence starting a decade ago as smart phones and tablets emerged, and it has continued to refine these capabilities. The list of upgrades and tweaks in MicroStrategy 2019 is long. Mobile Dossiers on iOS and Android devices have gained new table-of-contents and filtering features along with new bookmarking, commenting and notification capabilities. The latter make it easier to return to favored analyses, share comments with collaborators and flag updates of interest. New Library features for mobile devices make it easier to search for and find certified, recommended and recently updated Dossiers, apps and other assets. HyperIntelligence was the biggest and newest news in MicroStrategy 2019 and it’s another example of this vendor coming up with something unique in the market. The vendor also announced that it has achieved parity in supporting cloud deployment on Microsoft Azure as well as Amazon Web Services, and important option giving customers flexibility. I saw the Federated Analytics and Transformational Mobile announcements as refinements of existing MicroStrategy capabilities while the Enterprise Semantic Graph strikes me as something that has yet to reach its full potential as an enabler of smart, augmented analytics. I’m anticipating a richer story on this front at MicroStrategy World 2020. Customizable HyperCards can be configured to offer details on customers, left, products, right, or suppliers, organizations, employees and so on. As for the HyperIntelligence announcement, I think it’s promising and ready for broad adoption. Adoption will depend on the cost, which was not disclosed, and certain technical and security considerations. For now HyperIntelligence works with Google Chrome browsers with the aid of a plugin. Chrome accounts for more than half of all Web browsing, so that’s a good start, and MicroStrategy is working on supporting Safari and other browsers. At some firms, the plugins will get scrutiny from chief security officers. I talked to one bank customer who said plugins are frowned upon by security team, but he was excited enough by the promise of HyperIntelligence to explore approval. MicroStrategy previewed HyperIntelligence more than a year ago, and there were a number of beta customers on hand in Phoenix. During a keynote panel, Jason Pelky, CIO at the Gilbane Building Company, a global construction-management firm, said his firm has develop HyperCards to give salespeople quick insight into prospects when they’re preparing for calls. Their first instinct is to do Google searches, he said, but HyperCards quickly reveal when prospects are actually past customers, surfacing relevant history and project insights. French energy services giant Engie is using HyperIntelligence to deliver supplier and supply chain insights both inside and outside of its MicroStrategy-powered Procurement Information Center (PIC). The PIC system has more than 500 regular users of its eight core dashboards, according to Arnaud Droissart, Engie’s IS Procurement Manager, who presented on the topic. 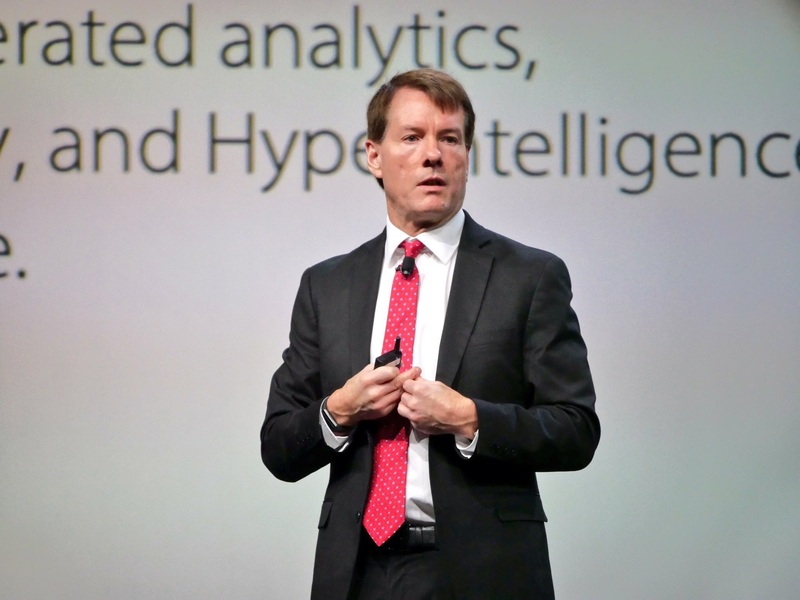 Droissart said the firm is using HyperIntelligence to surfaces stats, key metrics and other insights on suppliers, product categories and contacts to business users working within the company’s SAP Ariba system and various web-based ERP interfaces. What’s particularly exciting about HyperIntelligence is that it promises to bring new levels of intelligence to existing interfaces, reports, dashboards, applications and systems without having to replace anything. It’s purely additive rather than being a rip-and-replace proposition. In short, it’s a highly customizable and broadly deployable technology that could redefine expectations for available embedded analytics.